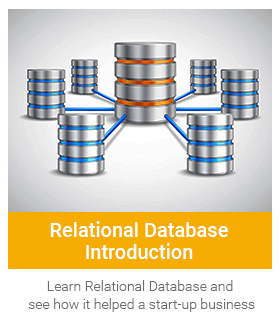 Our RDBMS course is a complete package for your database and backend knowledge requirements, with modules on Database Design Life Cycle, Entity Relationship Diagrams, Normalisation, all types of SQL commands, views, procedures, functions and triggers. RDBMS course is packed with nine brilliant modules! We offer a scenario-based online course complete with whiteboard videos, interactive quiz, programs and interview questions. And that’s not it! We will enable you with RDBMS industry best practices, methods to avoid errors, interesting facts and a story that helps you understand the practical aspect of RDBMS. Understand the basics of DBMS with Meaning of DBMS, ACID properties of DBMS, structured and unstructured data, Database Architecture, Distributed Databases, Data Models, Database Schema, RDBMS Concepts and EF Codd’s Rules. Finally, we will also give you some pointers on how to select the right RDBMS to suit your needs. Learn about the journey of data from conceptualization to logical design with Database Development Life Cycle. Design and create logical design of tables with information gathering, Entity Relationship Diagram / Model, Relationship types, Cardinality, Data abstraction, Keys and its types, data integrity and Data anomalies. An important lesson on normalisation and creating logical design of tables. Here, you will study how to convert logical design of database to physical design, along with the generalization and specialization of data. Learn different types of SQL data types and make appropriate selections for tables and finally a lesson on implementation phase of database design life cycle. We begin with basics of SQL like SQL Dialects and language elements and database schema. We study how variables are defined and programs can include operations, with arithmetic, logical and comparison operators. Also, learn SQL Syntax and how SQL commands are categorized with categories of Commands, Keywords and reserved words. A bonus lesson on RAID technology. We then enter the world of databases and tables and learn how to create them, along with various table constraints. Understand the difference between star and snowflake schema, and logical and physical data independence. We will also study alter, rename, drop and truncate table commands. Insert records in tables and update, merge or delete them using DML commands. Learn the meaning of phantom deadlock and how to avoid them. Write Select statements to display records of tables. Filter records with where clause, group by and order by clause. Use arithmetic functions, date and string functions. Learn how to insert records using Select statement. Practice using various clauses, functions and operators with Select statement to customize the rows and columns to be displayed. Use unions, intersect, except, joins and subqueries to display records from more than one table. Study about different types of joins and subqueries. Manage transactions and grant and revoke privileges using TCL and DCL Commands. Write functions, stored procedures, transactions, triggers and views in SQL.